F.A.T. Cat Haven is a retirement home and adoption center for cats. This is a no-kill, cage-free, facility and an alternative to euthanizing healthy pets. We rescue homeless, abused, and abandoned cats; provide them with medical care, and a safe, secure, loving environment. We accept cats in all stages of life; the elderly cat, orphaned kittens needing to be bottle-fed, cats with medical conditions, and the handicaped. They are cared for the rest of their lives or until they are adopted. This sanctuary is unique; it is the only one in Northern California and Southern Oregon that will provide quality care and medical needs for a cat's entire life. You can leave funds for your cats continued care in the event of your death or incapacitation. Please help by giving generously. No donation is to small. Funds are need to add an additional building with rooms to shelter sick cats, intake area for new cats entering the sanctuary, and a room for boarding cats. Please help in any way you can and remember your donations are tax deductible. 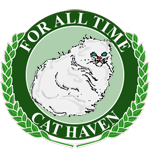 For All Time Cat Haven is a 501(c)(3) nonprofit charity. All donations are tax-deductible to the full extent of law. Copyright © Star Donor Charity Solutions. All rights reserved.